In today's era of "standardized and aggressive playing", creative players are needed in every position. Exactly what do we mean by creative soccer? Is creativity trainable at all, and if so, how? Günther Netzer, the former German world-class player and soccer expert and entrepreneur recognized today readily speaks of the lack of creativity in the sport when he is bored by a game. We all like the creativity of the Brazilian samba soccer players of 1970 and go into raptures when we think of the German national team of 1972 or the Dutch national team of 1974 with "Soccer-Total." Pele, probably the most popular and beloved soccer player in the world, called the "Soccer king," is the epitome of the creative, "productive" form of this sport. His playing was relaxed, improvised, and effortless. His way of playing followed no definite pattern of action, but was the result of a flow, marked by enthusiasm ,,, by pure creativity. This kind of creativity was art and belongs to the past. Players nowadays need regular and systematic creative training to be able to be creative at all! Some principles are familiar - I will touch on these only briefly - while some are less familiar or not at all familiar - I will discuss these principles in detail. This large portfolio of agility patterns is to initiate his "own process" for the player and to pursue the objective of developing his own optimal body awareness. His own optimal body awareness leads to an improved technique. My crunch time coaching includes the constant modification of plays from the aspects of time and space. The new "Can-Do" of the player is constantly stimulated under the most massive stress situations for the game day. With this "real transfer" for today's game, creative training goes distinctly further than the world-renowned Coerver coaching. The idea originates from Dr. Stefan Raadts. It is a question of providing a platform outside of the playing field. The players here have a "space" for matters and topics outside of sports, such as anxiety, pressure, and frustration. This "other way" of forming a relationship between trainer and player naturally makes high demands on the pedagogical capabilities of the trainer. Dr. Stefan Raadts: "It's not only a matter of the purely athletic benefit of person-oriented training, but also of effectively combating burnout and depression of players subject to stress." Result: This holistic creative training is perhaps the most effective innovation for today's high-speed soccer. 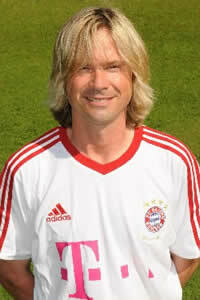 Gunther Netzer can therefore be helped. Burow O.A. (2000) I am good, - we are better. Success model of creative groups. Stuttgart: Klett-Cotta. Burow O.A. (1999). The individualization cases. There is creativity only in the plural. Stuttgart: Klett-Cotta.